When a webpage redirects you in an endless loop, Firefox will display an error with the message, The page isn't redirecting properly. 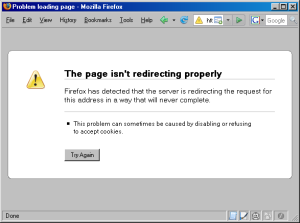 Firefox has detected that the server is redirecting the request for this address in a way that will never complete. This article describes a few things that you can do to stop these errors. If the problem is occurring on only selected web sites, you may be using bookmarks made from web pages that saved parameter information that no longer produces a viable page. Right click the bookmark and select "Properties"
Click "Bookmarks -> Organize Bookmarks"
Click it to select it. Choose another bookmark or close the Organize Bookmarks window with the red button. Firefox must be set to accept cookies from websites. Go to "Tools -> Options -> Privacy"
Make sure "Accept cookies from sites" is checked (see note below). Make sure the site you're trying to access is not in the Exceptions list. Note: In Firefox 3.5, if you do not see the "Accept cookies from sites" option in the Privacy panel, set the "Firefox will:" option to "Use custom settings for history". Go to "Tools -> Options -> Privacy -> Show Cookies..."
In the Cookies window, click "Remove All Cookies"
Note: In Firefox 3.5, if you do not see a "Show Cookies..." button, set the "Firefox will:" option to "Use custom settings for history". Alternately, click the "Remove Individual Cookies" link (if present) to open the Cookies window. Double click on it. A dialog will appear. Enter 2 into the dialog. The problem could simply be an error in the website's coding or server configuration. Contact the webmaster for assistance. Note: If you are seeing this error on the apps.facebook.com website, this is a Facebook bug (workarounds are posted here).